3D Nails: Fab or Fail ? Lately I have noticed a rise in 3D nail designs. Whether its studs, chains, bling, flowers, gems or pearls,more and more girls are opting to add dimensions to their nail styles. Celebs such as Rihanna, Lady Gaga, and Beyonce have been spotted sporting this new nail trend as well. I personally like the trend, but in my opinion it is one that can be easily overdone. As long as its kept in moderation, I am a fan. What do you guys think of the trend? Is it Fashion Fab or a Fashion Fail? Would you ever try it? This pattern is perfect for Spring. It’s part of the nautical trend that is becoming very popular right now. Stripes are very versatile. They can be used for a more polished streamlined style or a fun carefree look, depending on how you dress them. Another bonus for stripes is that they can flatter your body shape. If you want to make your body look slimmer opt for thinner, vertical stripes. For my girls with less curves than they desire, you can wear thicker, horizontal stripes to make you look wider in certain areas. Try a striped maxi dress like the one above from forever21.com. Its only $14.80. Polka dots are just fun fun fun! This print is definitely a must have for spring, especially when it comes in pastel colors. The oversized top pictured above is from acidlace.com, a vintage site based in the UK. It is priced for 15euros and would look great with high-waisted white shorts or a pair of tights. Aztec print is definitely a spring print for my ladies with funkier style. The tribal-inspired print usually brings together a variety of colors and geometric shapes to create something that is eclectic and stylish. 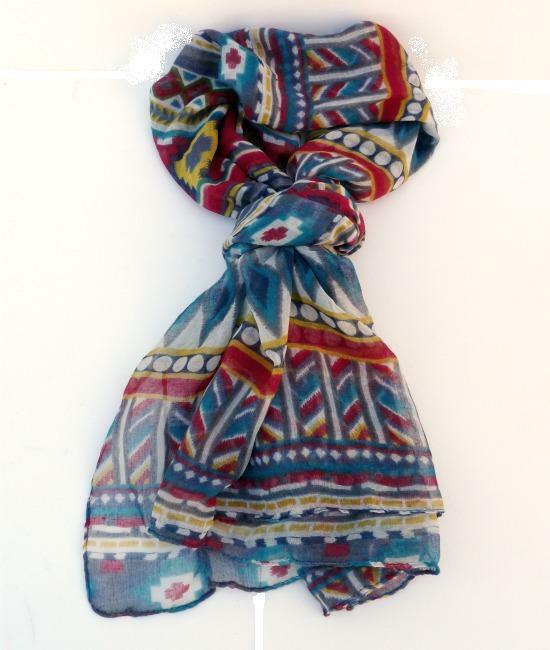 For instance this beautiful Aztec scarf from thestellarboutique.com. It is 14euros and features a series of bold colors that come together in a way that is somehow cohesive and chic. That’s the beauty of Aztec! Lace is a pattern that is really in for any season, but in bright colors is especially fab for spring. The breathable material gives a flirty, girly edge to any outfit and when worn correctly, is a perfect testament to the light-brightness of springtime. Check out the yellow lace shorts above, aren’t they to die for? They would be perfect paired with a white cami, a denim vest, and a statement necklace. Oh yeahhh. Last but not least an obvious choice for spring, floral print! In this season, flowers are blooming and the world is coming to life again; what wonderful inspiration for fashion. For springtime, I definitely recommend florals with pastel color schemes, however the more it warms up, the more tropical you can get with the colors and shapes of your florals. 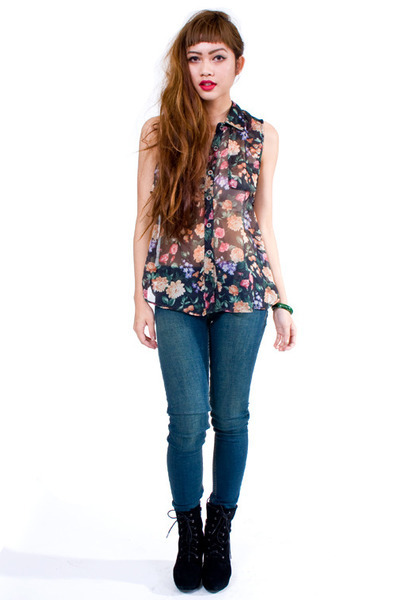 The floral chiffon tank blouse pictured above is from chictopia.com and is $38.00. The black gives an edgier take on springtime but the colors of the flowers keep the outfit bright and right for the season. Which is your favorite of these prints? Vote below! I am so excited. The weather is warming up and it is officially sandal season !!!! I pulled out one of my fave pairs today. They are from Charlotte Russe. I bought them about a year ago and I believe I paid $15 for them. Love, love, love ’em!!! Btw, I already know I am too bold for posting my naked toes with no polish. A hot mess, I won’t deny. Don’t make fun of me too much!lol If you guys have any recommendations for some cute springtime colors to put on my toesies, please let me know . Until Next Time, Smooches ! Ombre’ is an artistic term defined as a color shaded or graduated in tone. The color gradients can move to dark to light or light to dark. We are seeing a lot of this trend in fashion these days, some of it in clothing, but mostly in hair. Many fashionable celebs have been rocking this sun-kissed hair-trend from Khloe Kardashian to Rachel Bilson. This is a trend I personally cannot wait to try myself, though I wouldn’t dare bleach the ends of my real hair. Next time I install extensions I will have a little DIY project on my hands! I plan to use the videos below as a guide to do my own ombre’ do. Join me in the ombre’ adventure and let me know how it goes! if you’ve already done ombre’ show me pics of how it turned out and let me know your tips for achieving sun-kissed locks.